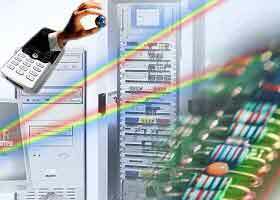 Telecommunications engineering or telecom engineering is a major field within electronic engineering. Telecom engineers come in a variety of different types from basic circuit designers to strategic mass developments. A telecom engineer is responsible for designing and overseeing the installation of telecommunications equipment and facilities, such as complex electronic switching systems to copper telephone facilities and fiber optics. Telecom engineering also overlaps heavily with broadcast engineering. Telecommunication students on various telecommunication devices like mobile phones and cable TV and also deal with computer networking, TV radar, navigation and satellites. There is a huge demand for telecommunication engineers in this age of satellites, internet and mobile telephony. A telecommunication engineer should be adept in public speech, technical writing and project management besides having a sound knowledge of both computer hardware and software. Higher Secondary or 10+2 Examination with physics, chemistry and mathematics as mandatory subjects to become eligible for entrance tests like the IIT Joint Entrance Examinations and the Joint Entrance Examinations conducted by various states. For acquiring a post- graduation degree a student must have a B.Tech degree in telecommunication from an All India Council of Technical Education approved University. Jobs are available in bulk with the govt organizations and in private sector for the eligible candidates. Few organization who offer jobs are VSNL, Airtel, Vodafone BSNL, Reliance, Tata Indicom Nokia, Siemens, Motorola or Apple Technologies etc.